My fiancé and I have just moved to Vancouver from Australia and are trying to plan a wedding in a city we don't know. We have the reception venue locked in, I have the dress, but have no idea where we can have the ceremony. The wedding is this January, so it will be stupidly cold and most certainly raining (we're from Perth, rain and cold are novel concepts). We have been looking for an awesome industrial or art gallery space around the Gastown/downtown area but the search has been less than successful. 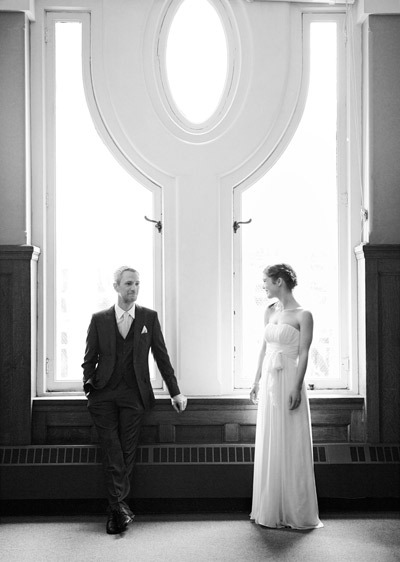 Can any of your amazing Vancouver readers recommend a great ceremony venue/space for about 35 people? We have been looking for over two months now and badly need some advice from a local or at least someone who has been here longer than one month. Slightly freaking out about sending this!! First off, kudos to you on your work planning a wedding in a new city! It’s tough, and Vancouver is a city with so many choices for wedding venues! I lived there for 10 years and got married there in 2011, so I’m happy to share some local knowledge with you! For a January wedding, inside is definitely the way to go. I won't bother listing the many gardens that are available for weddings, such as Van Dusen Gardens or the UBC botanical gardens, (which is where I got married). And since you said you already had a reception venue, I’m not going to list any of the multitudes of hotels/restaurants downtown. Steamworks Brewing Company – More than just a great place for lunch! They have some lovely looking back rooms that would be beautiful, right by the harbor and Waterfront station. Shebeen Whisky House – Owned by a group called the Heather Hospitality Group that owns a lot of other restaurants/cafes in Gastown (which are totally worth going to even if not for your wedding). Not sure if you’re a whisky person (or if your groom is), but this place is pretty cool looking. At the bottom of the page they say “Shebeen opens at 6pm from Tuesday-Saturday, but can open other hours for private events.” Note: If you are inviting kids to your wedding, this place may not work. Scotia Bank Dance Centre – They have a few studios you can rent and they all have SO many windows, so even if it’s grey and rainy you will get lots of light inside. Roundhouse Community Centre – The Exhibition Hall at the Roundhouse is very industrial feeling, with lots of iron, wood and such. It’s pretty big, so definitely bigger than what you’re looking for, but I would feel remiss if I didn’t mention it. If none of these work out, I would suggest taking a walk through Gastown and downtown and popping in to places that look like they might fit. Many of the restaurants have private space for events. I hope this helps and all the best with the wedding planning! I suddenly have an intense urge to get married in Vancouver. I'm gonna throw in a shout-out for my fabulous caterer <a href="http://www.trufflesfinefoods.com/>Truffles Fine Foods</a> who served the most delicious meal for such a reasonable price at our wedding. Check it out Vancouver! They cater films, which means they understand timing, they can adapt and they make fabulous food. I live in Vancouver and agree that the Shebeen could be awesome for a small group. 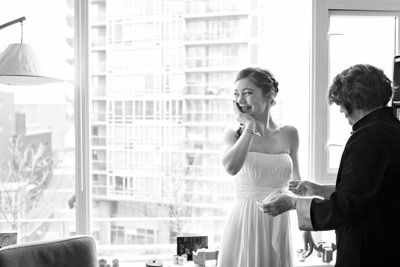 I got married here in January and had an evening ceremony and reception at the awesome Waldorf Hotel in East Vancouver. Could not recommend it more highly. The Vancouver Urban Winery is new and may fit your needs. Also check out Chapel Arts. Not sure who will be officiating your ceremony, but since you cannot get married at City Hall in Vancouver (otherwise I would have done it myself), some officiants perform small ceremonies in their homes. Oh! Check out the Beatty Biodiversity museum at UBC too. Getting married beneath a blue whale skeleton would be so awesome. Is there some reason you can't get married at your reception venue? I think it would be so much easier to do it at all at the same place. Ceremonies are usually so short, it's nice not to have to arrange two places. Of course I got married in a church and did NOT want my reception there. And for all those Vancouver ladies not getting married in January and looking for an outdoor venue, check out UBC farm. Our ceremony was there, and it was gorgeous. Our reception was at Heritage Hall, and it was perfect. I highly recommend that venue, but it's not quite as urban industrial as I imagine this bride is looking for. I have no idea how much renting one of the smaller spaces at the Dr Sun Yat-San Garden would be, but it's worth looking into for at least the ceremony and then head elsewhere for the reception. Also check out the waterfall building near granville island. It used to be an art gallery and they rent it for weddings.